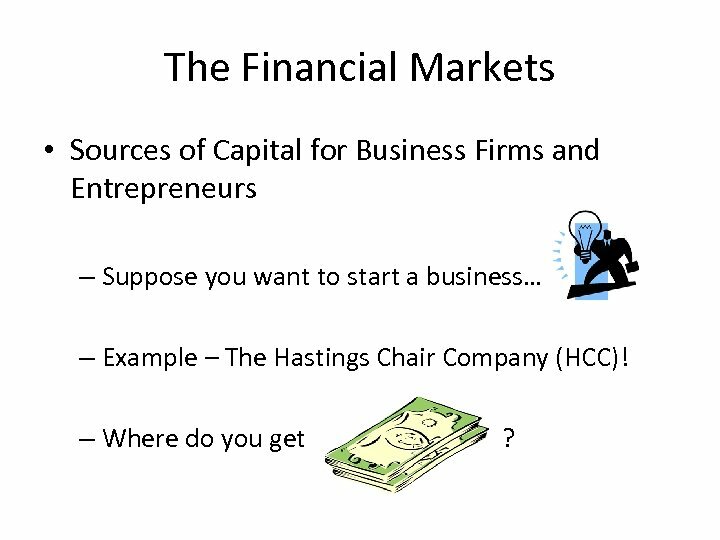 The Financial Markets • Sources of Capital for Business Firms and Entrepreneurs – Suppose you want to start a business… – Example – The Hastings Chair Company (HCC)! – Where do you get ? 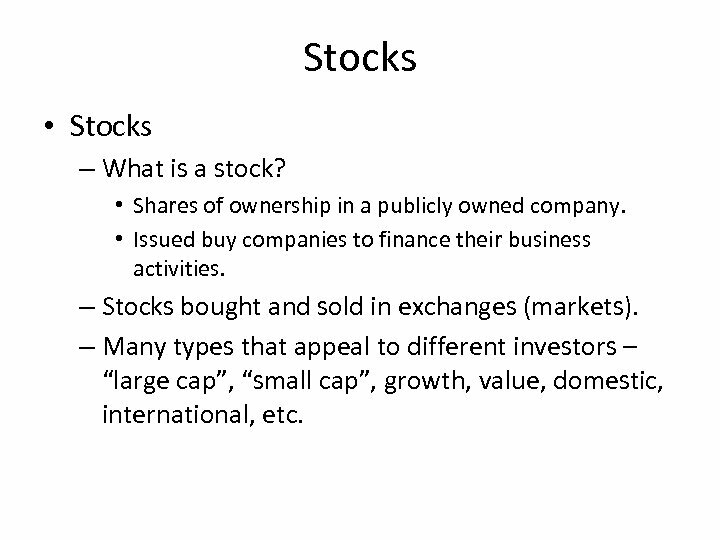 Stocks • Stocks – What is a stock? 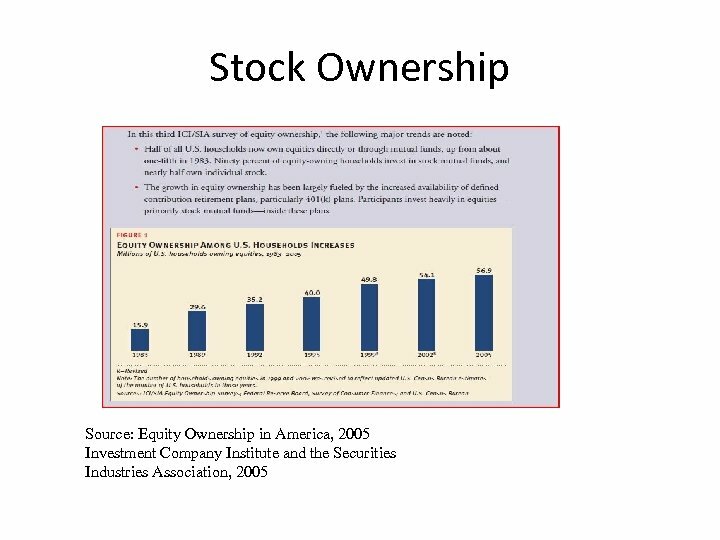 • Shares of ownership in a publicly owned company. • Issued buy companies to finance their business activities. – Stocks bought and sold in exchanges (markets). 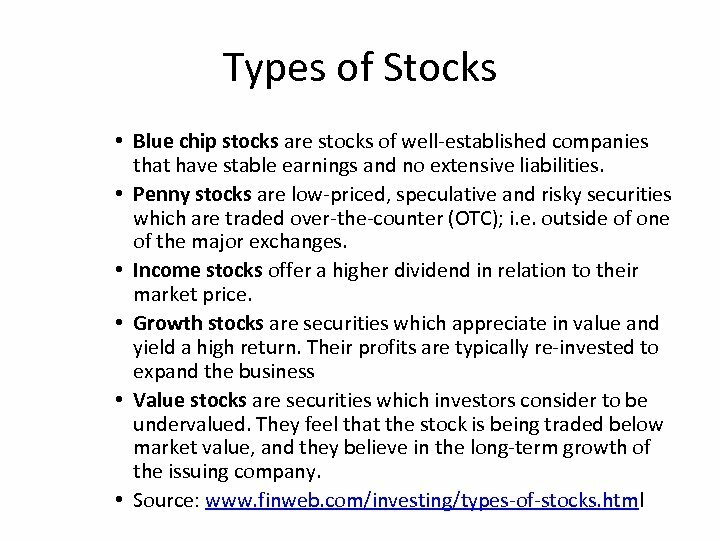 – Many types that appeal to different investors – “large cap”, “small cap”, growth, value, domestic, international, etc. 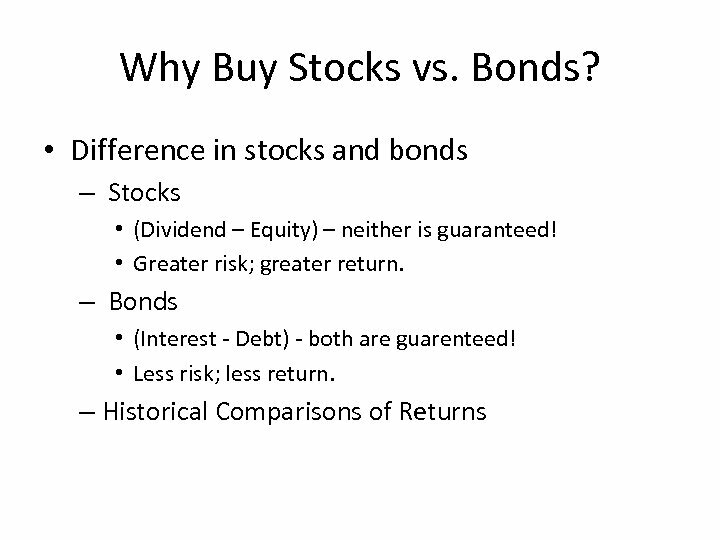 Stocks – Why buy stocks? 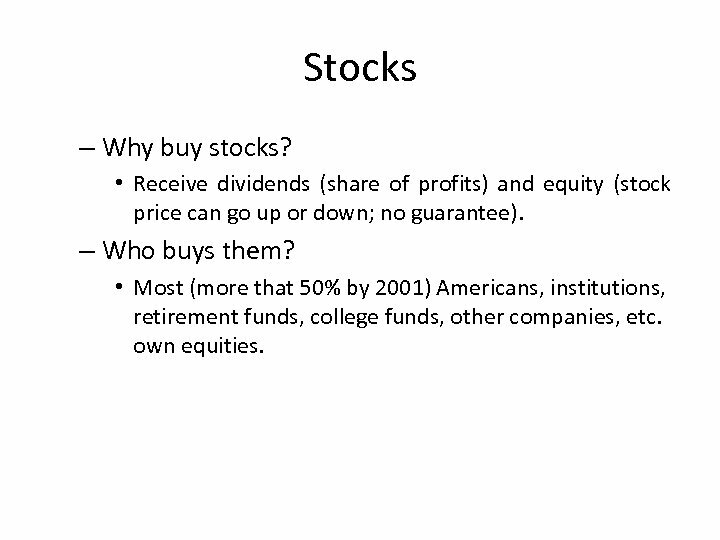 • Receive dividends (share of profits) and equity (stock price can go up or down; no guarantee). – Who buys them? 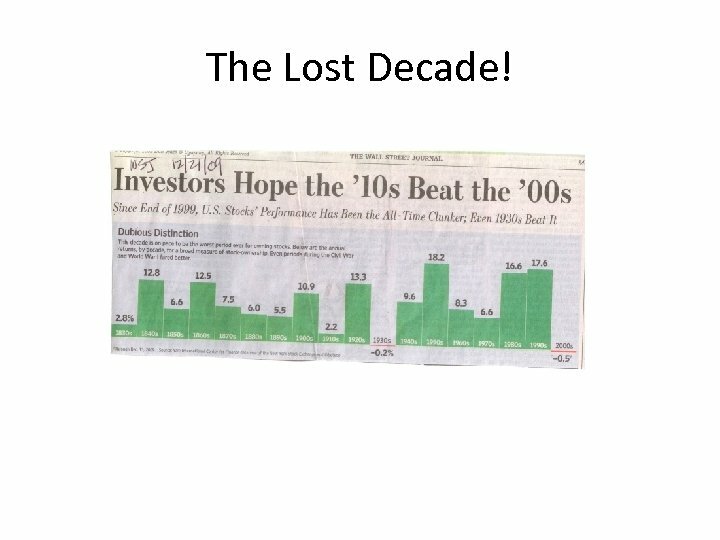 • Most (more that 50% by 2001) Americans, institutions, retirement funds, college funds, other companies, etc. 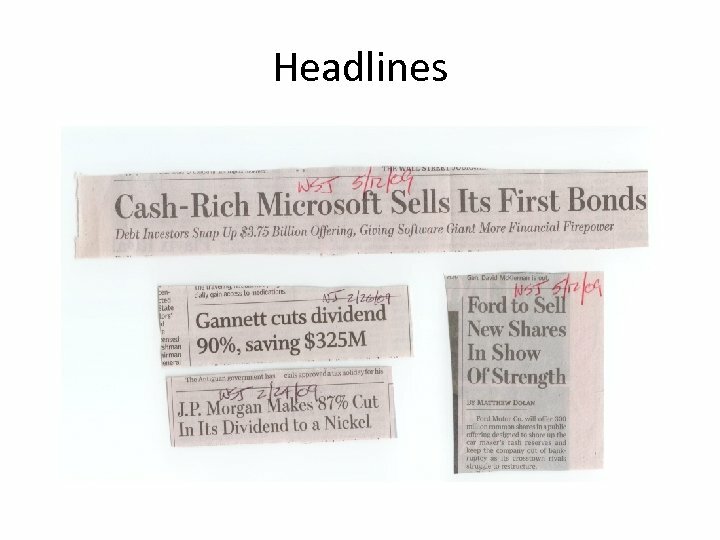 own equities. 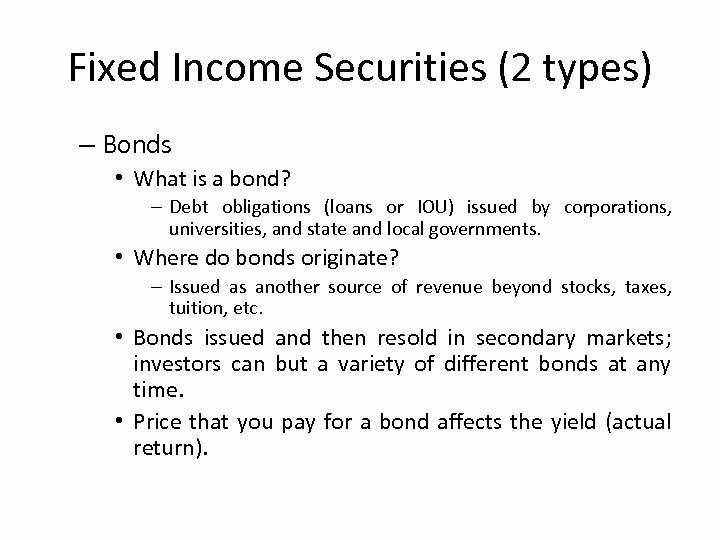 Fixed Income Securities (2 types) – Bonds • What is a bond? – Debt obligations (loans or IOU) issued by corporations, universities, and state and local governments. 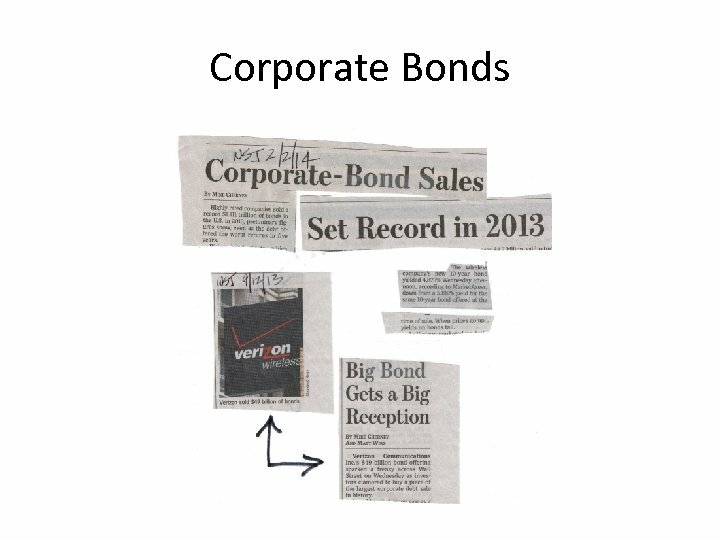 • Where do bonds originate? 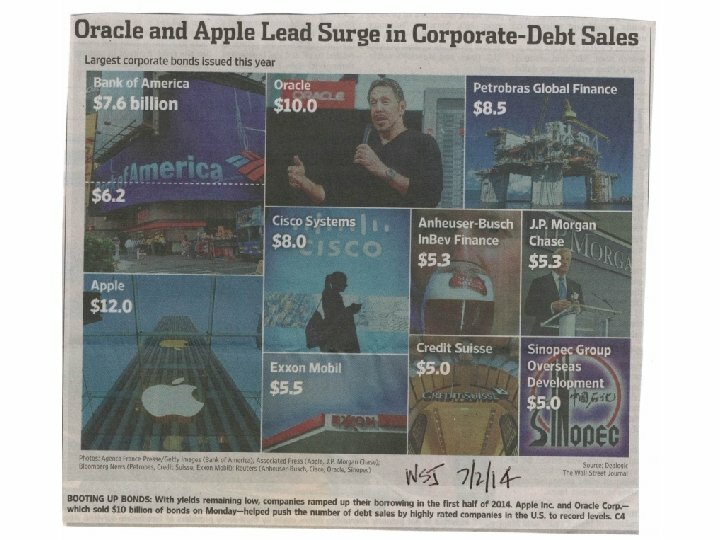 – Issued as another source of revenue beyond stocks, taxes, tuition, etc. 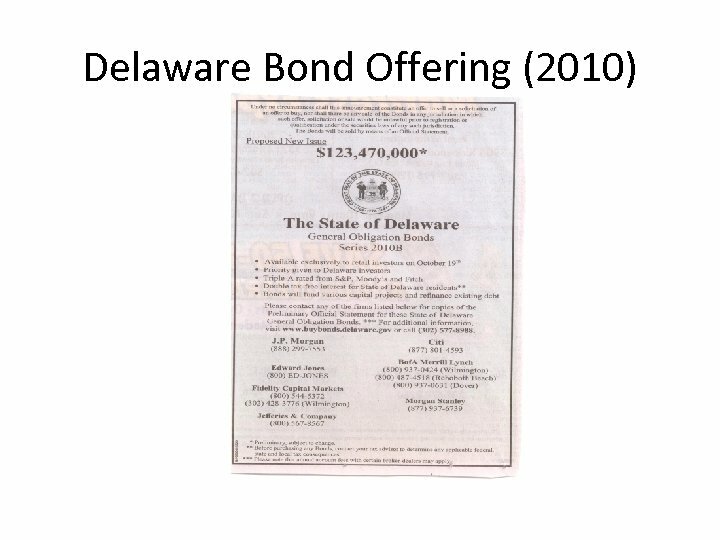 • Bonds issued and then resold in secondary markets; investors can but a variety of different bonds at any time. 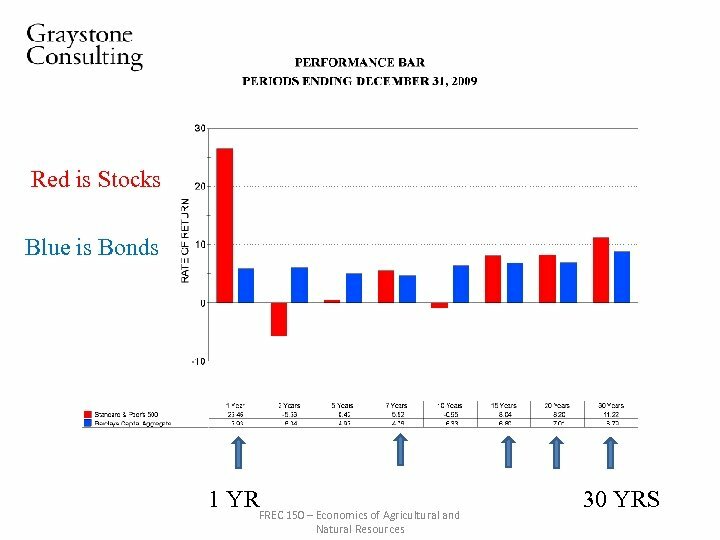 • Price that you pay for a bond affects the yield (actual return). 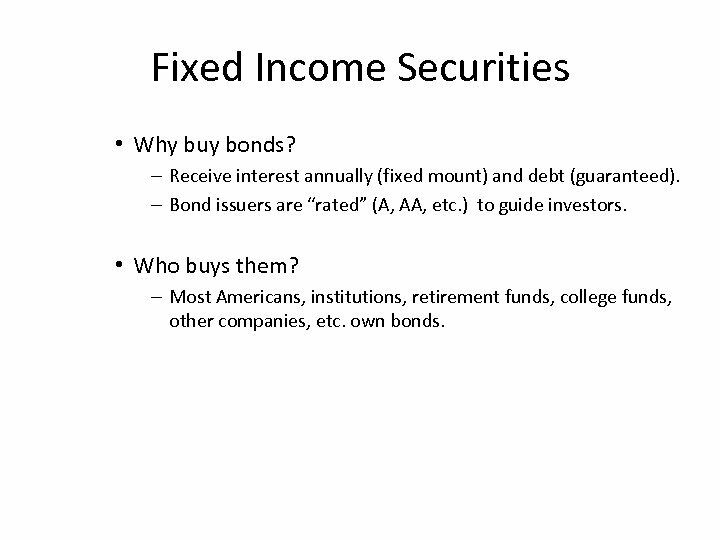 Fixed Income Securities • Why buy bonds? – Receive interest annually (fixed mount) and debt (guaranteed). 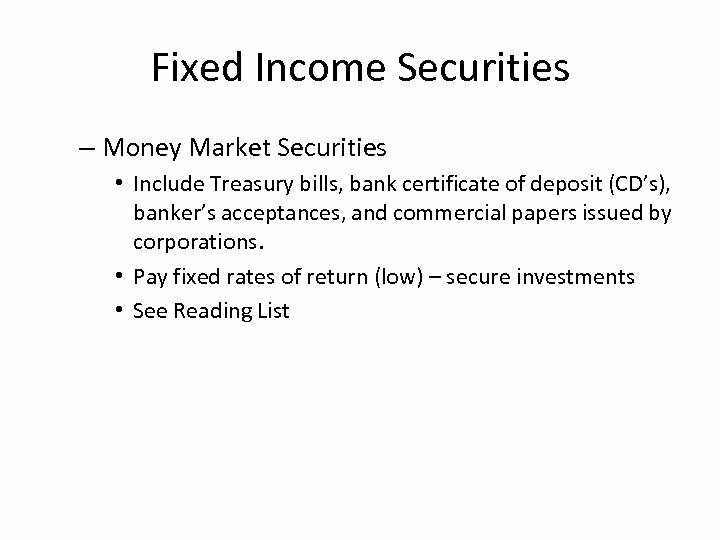 – Bond issuers are “rated” (A, AA, etc. ) 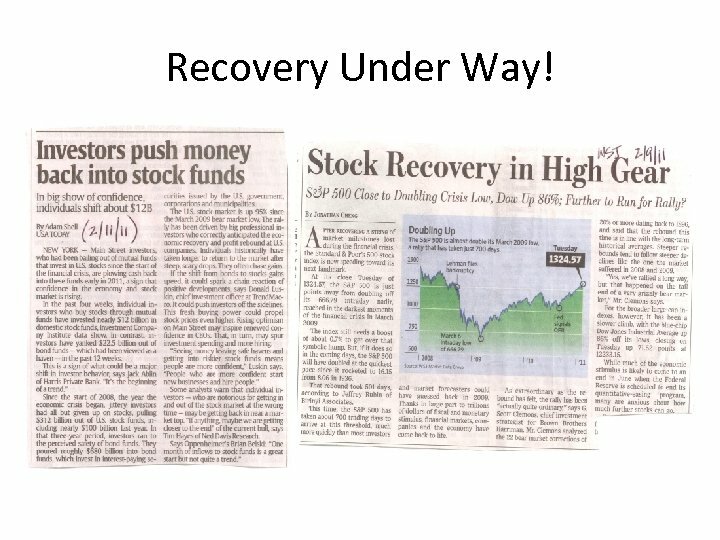 to guide investors. • Who buys them? 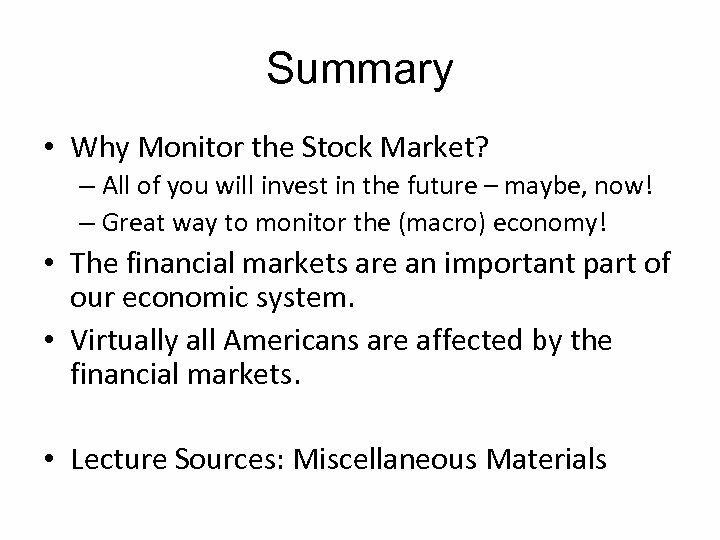 – Most Americans, institutions, retirement funds, college funds, other companies, etc. 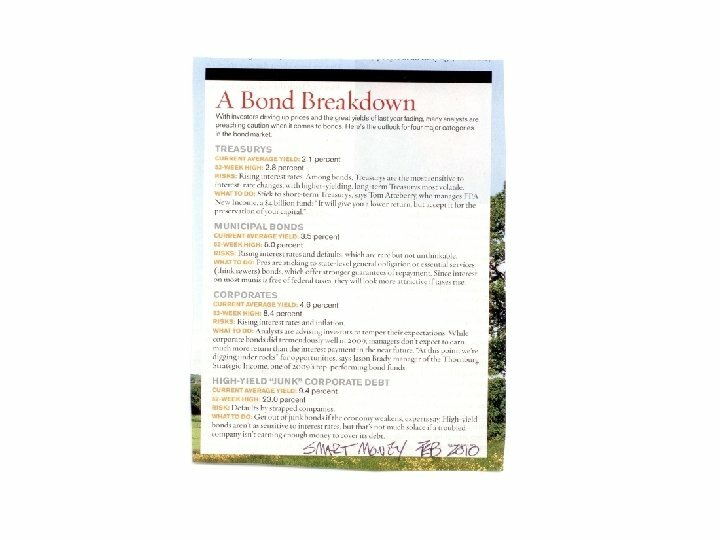 own bonds. 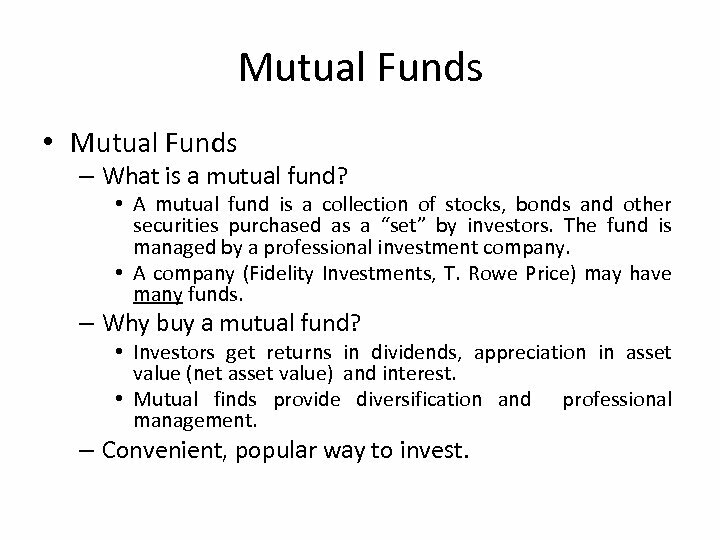 Mutual Funds • Mutual Funds – What is a mutual fund? 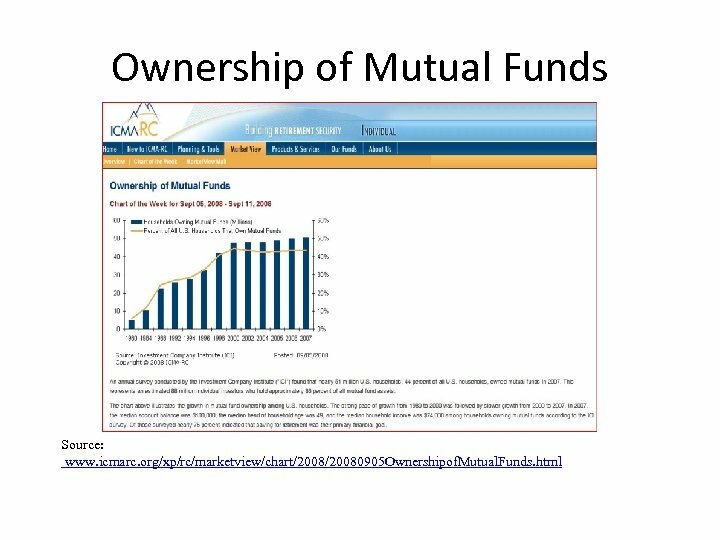 • A mutual fund is a collection of stocks, bonds and other securities purchased as a “set” by investors. 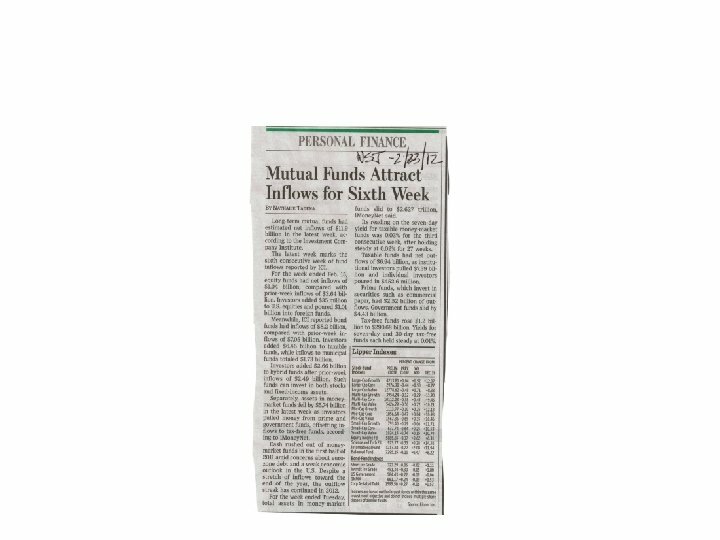 The fund is managed by a professional investment company. 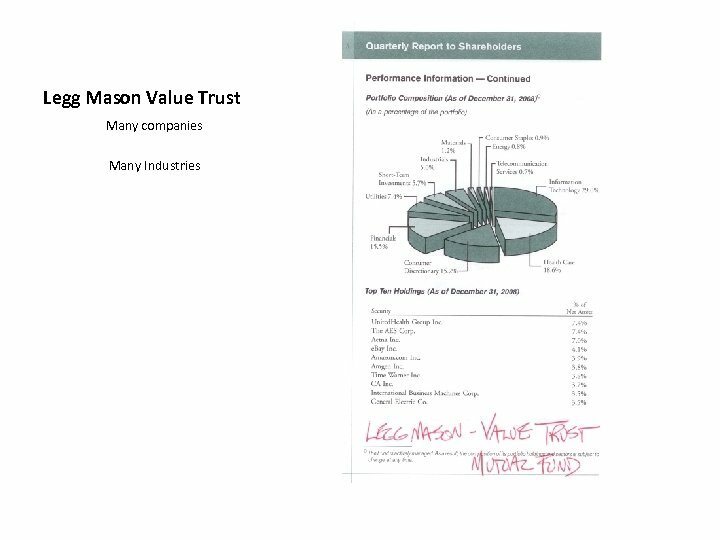 • A company (Fidelity Investments, T. Rowe Price) may have many funds. 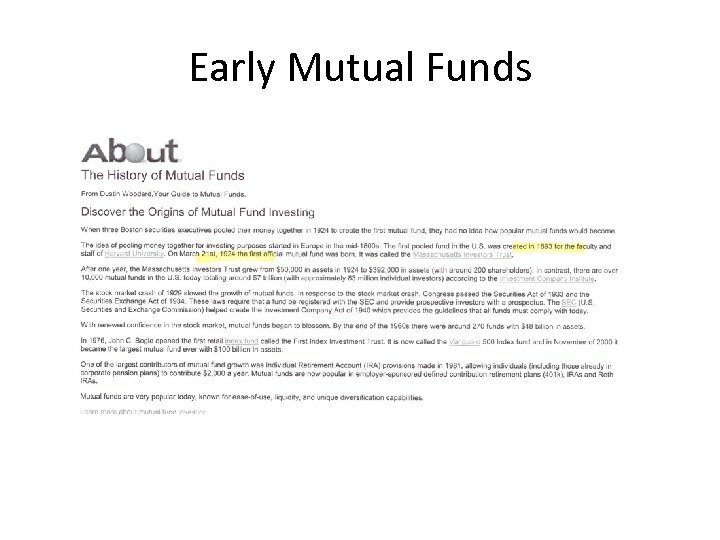 – Why buy a mutual fund? 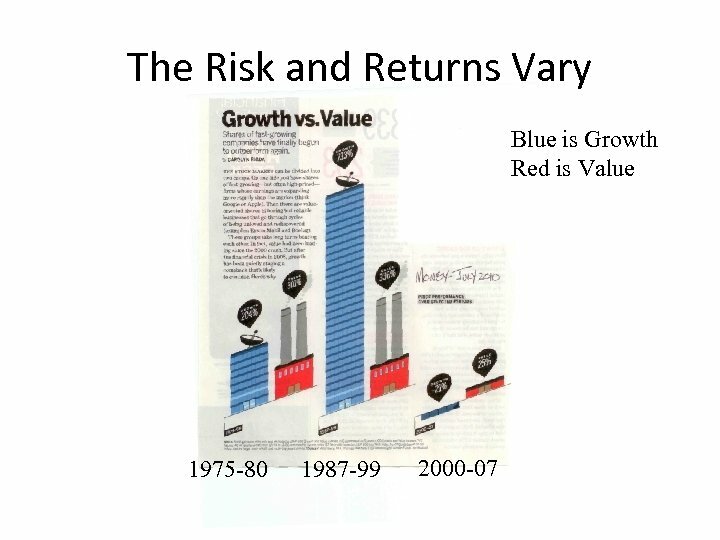 • Investors get returns in dividends, appreciation in asset value (net asset value) and interest. 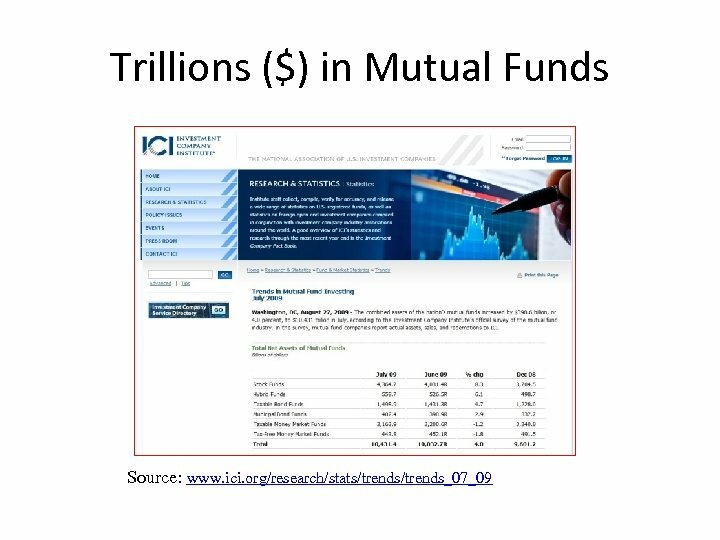 • Mutual finds provide diversification and professional management. – Convenient, popular way to invest. 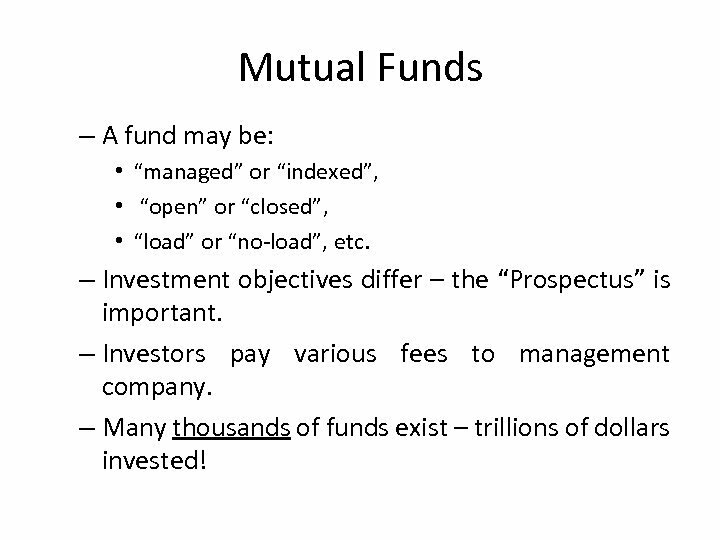 Mutual Funds – A fund may be: • “managed” or “indexed”, • “open” or “closed”, • “load” or “no-load”, etc. 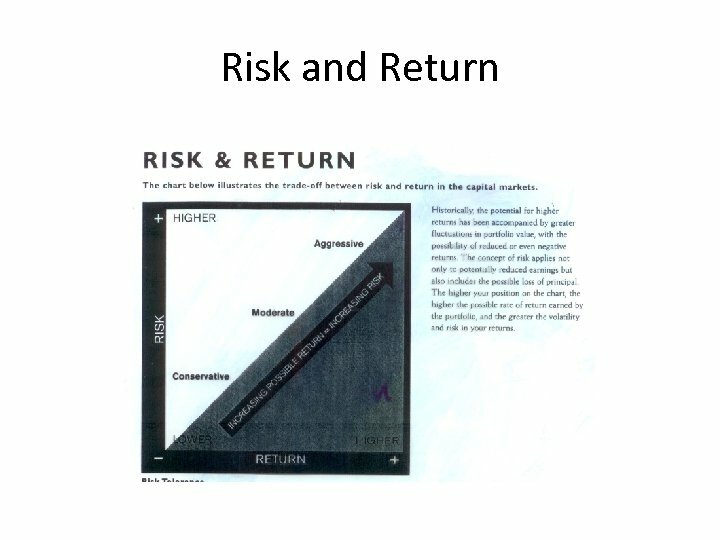 – Investment objectives differ – the “Prospectus” is important. – Investors pay various fees to management company. – Many thousands of funds exist – trillions of dollars invested! 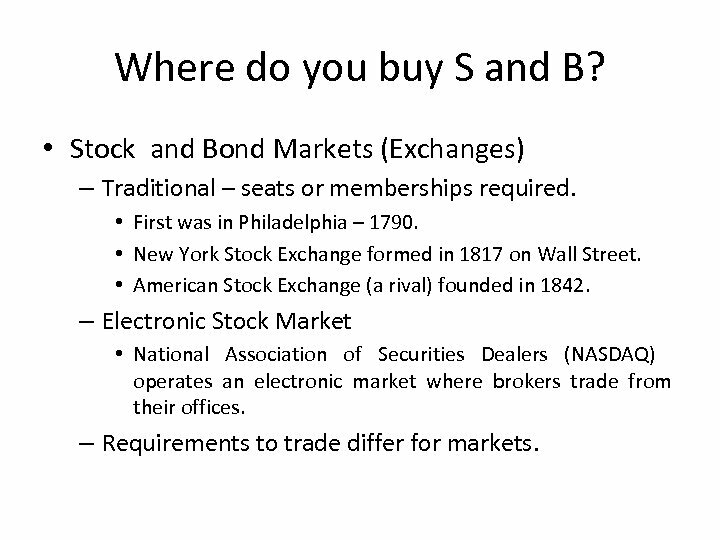 Where do you buy S and B? 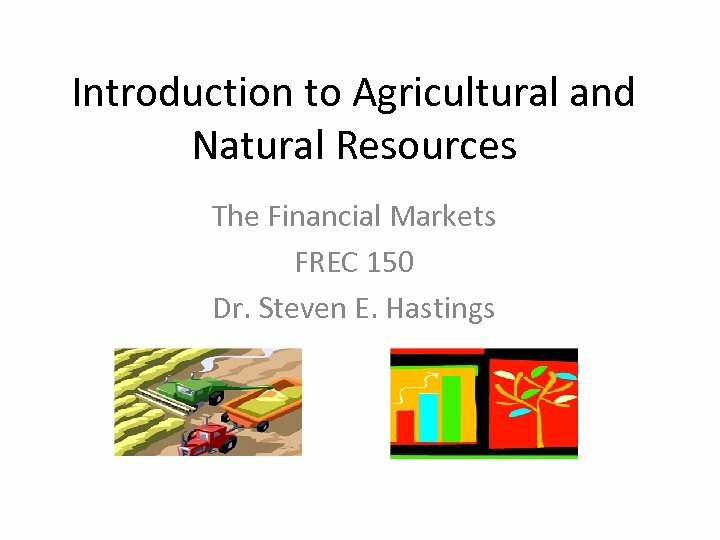 • Stock and Bond Markets (Exchanges) – Traditional – seats or memberships required. • First was in Philadelphia – 1790. 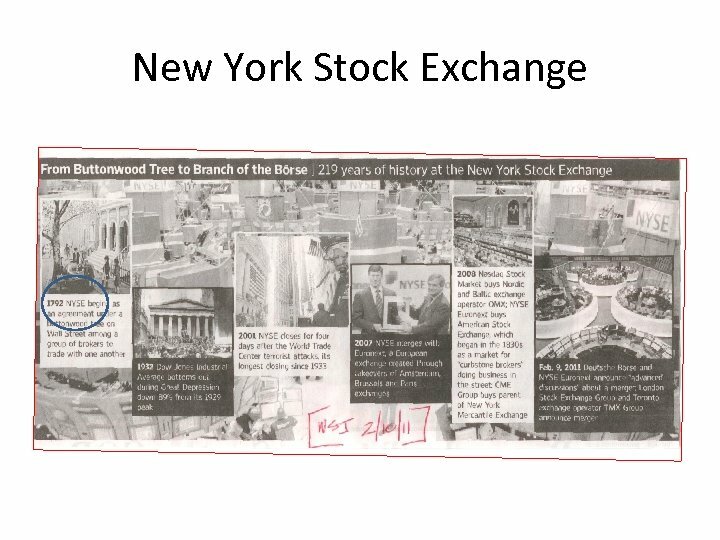 • New York Stock Exchange formed in 1817 on Wall Street. • American Stock Exchange (a rival) founded in 1842. 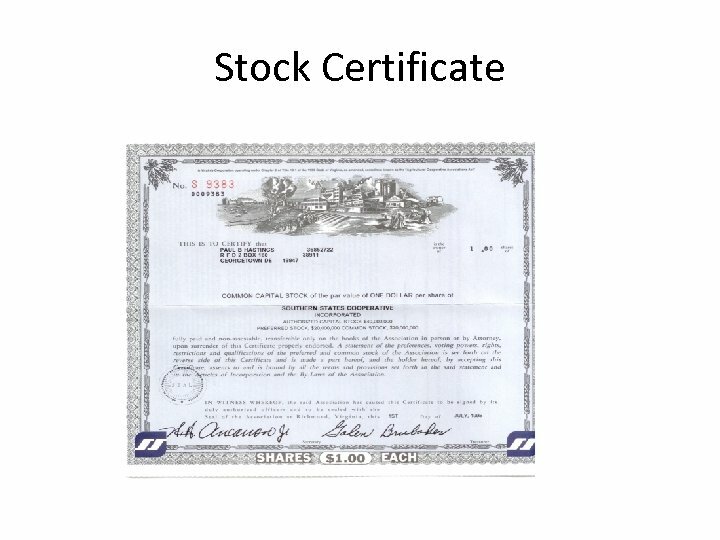 – Electronic Stock Market • National Association of Securities Dealers (NASDAQ) operates an electronic market where brokers trade from their offices. – Requirements to trade differ for markets. 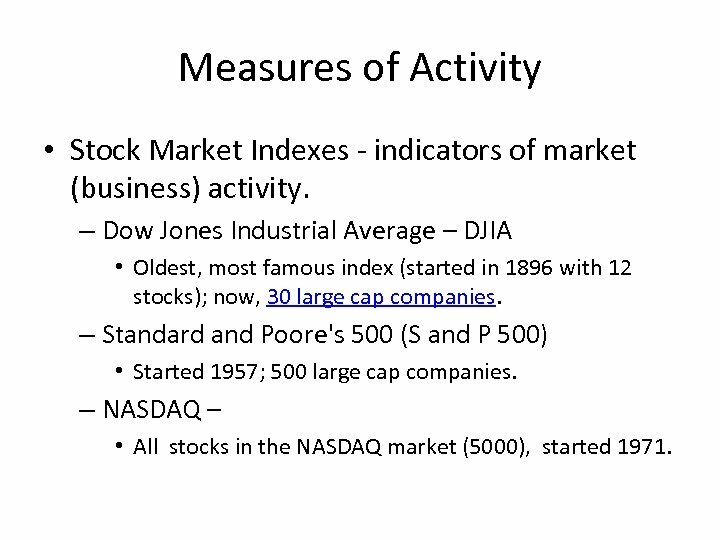 Measures of Activity • Stock Market Indexes - indicators of market (business) activity. 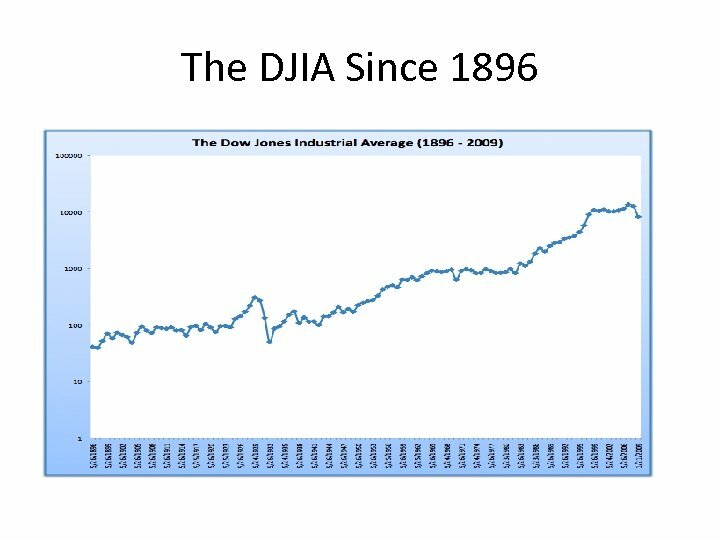 – Dow Jones Industrial Average – DJIA • Oldest, most famous index (started in 1896 with 12 stocks); now, 30 large cap companies. 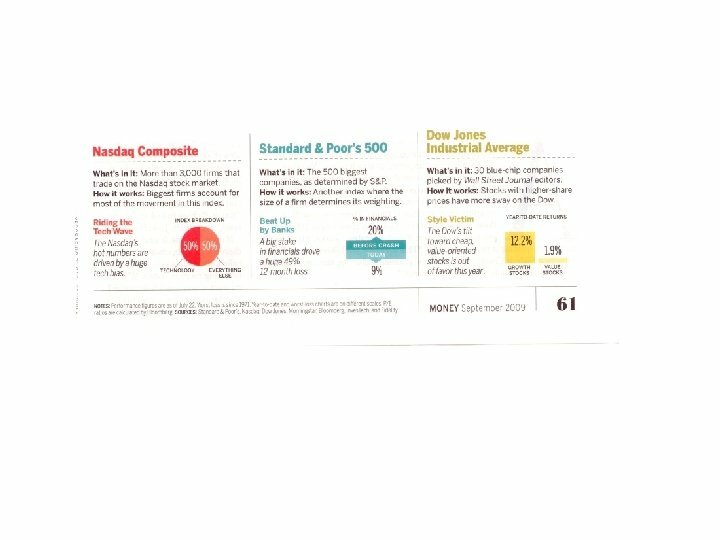 – Standard and Poore's 500 (S and P 500) • Started 1957; 500 large cap companies. 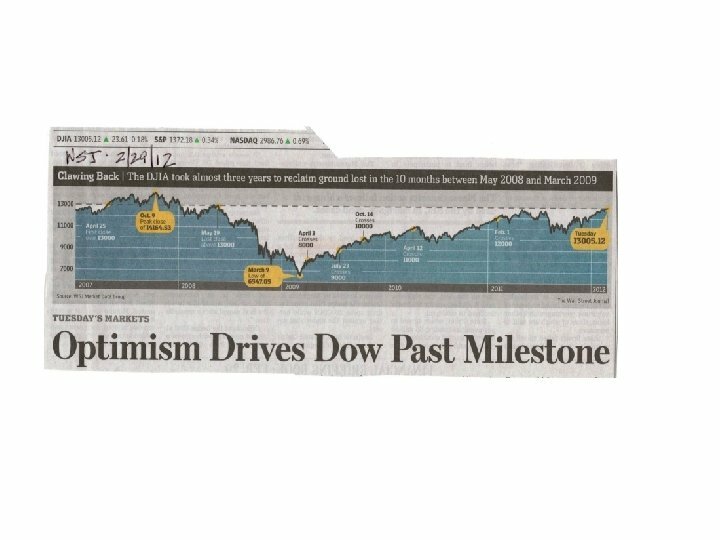 – NASDAQ – • All stocks in the NASDAQ market (5000), started 1971. 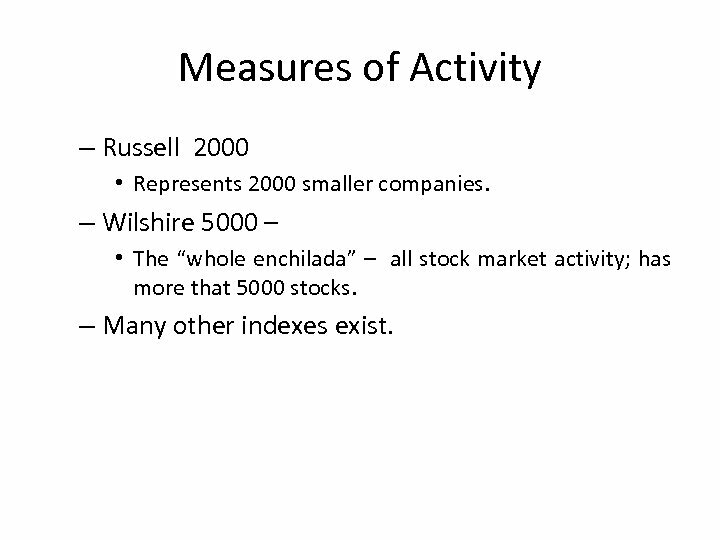 Measures of Activity – Russell 2000 • Represents 2000 smaller companies. 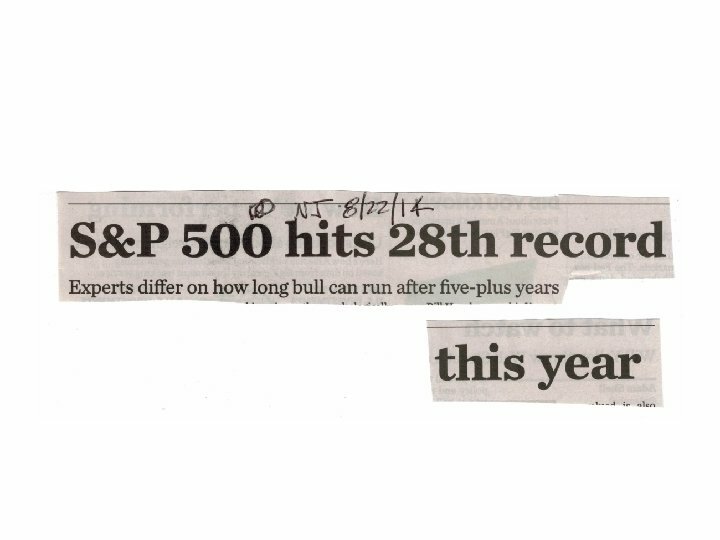 – Wilshire 5000 – • The “whole enchilada” – all stock market activity; has more that 5000 stocks. 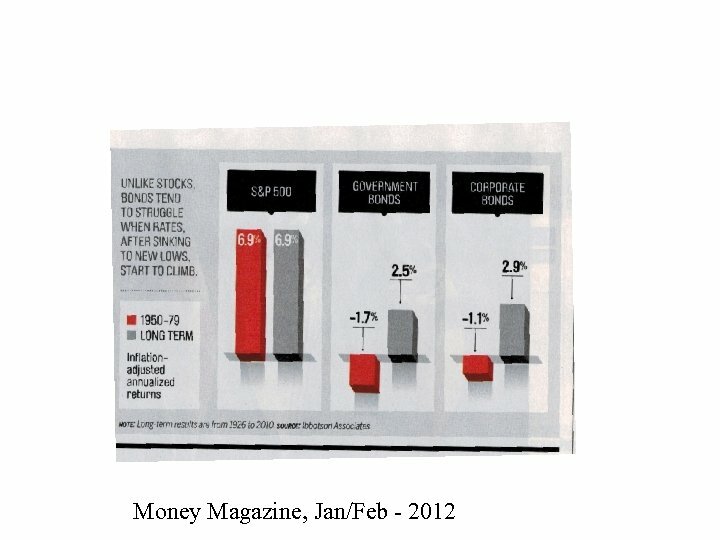 – Many other indexes exist. 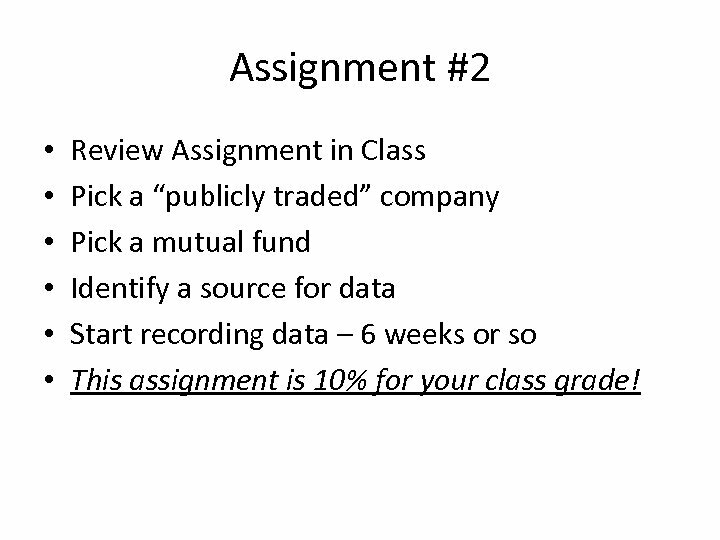 Assignment #2 • • • Review Assignment in Class Pick a “publicly traded” company Pick a mutual fund Identify a source for data Start recording data – 6 weeks or so This assignment is 10% for your class grade!